Making its debut in 2004, steadily the dimensions of the S series by Codecasa increased from 35 metres to 41 metres in 2007, and then stretched to 45 metres with the construction of Framura 2, who is owned the same owner as Framura 3. The owner was evidently satisfied with the project and the yard but wanted to expand the dimensions and living space aboard and so commissioned this new 50m built with the high-quality and technical content that is the yard’s tradition. The new Framura 3 by Codecasa has four guest cabins, a VIP, the owner’s suite on the main deck, a gymnasium, many open-air spaces, and sober yet elegant furnishings. 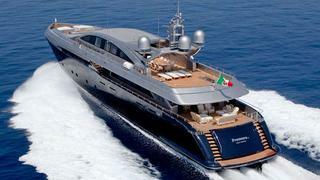 She is a modern yacht created by one of the oldest yards in the history of Italian yachting, dating back to 1825. Codecasa and the group’s engineers have considerable experience in the area of planing hulls, built up through the regular supply of craft to the Coast Guard. The yard now builds boats sought out by specialists and considered among the best in the world in this sector. Codecasa, with its S series that has now been on the market for almost 10 years, has had the possibility to focus on this sector and to develop the materials, engineering and in particular the engines required. These engines are now lighter and more powerful than in the past and, in this case, are augmented by three KaMeWa waterjet systems, with the central one functioning as a booster. The owner contributed significantly to the interior decorations, working with the designers, creating a customised yacht, while trusting the yard completely to the construction of the naval architecture. Stay tuned for a feature story on Framura 3 in an upcoming issue of Boat International magazine.